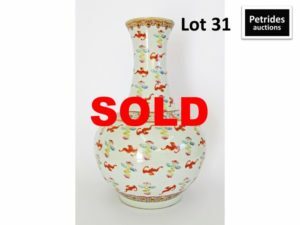 A Large Chinese porcelain ovoid shaped bottle vase with a long wasted neck and a short foot, decorated in Famille rose colours with bats and clouds on a white ground. Bearing a Qing Dynasty, Guangxu (1875-1908) underglaze blue mark to base and probably of the period. Height approx.. 40cm.